Over 4000 runners contested the four races which make up the annual Milton Festival of Running. First off was the 20 miles event with a field of over 800 starters. Paul Navesey(Crawley) led from the gun to win in a course record of 1.52.13. Star of the day for MMKAC was Rachel Robinson who won the ladies race with a personal best of 2:13.35(improving by some 4minutes). Kirstie Meeton(Bedford) led for a long time before Rachel tracked her down at 15miles and finished strongly to win by just over a minute. Another PB was set by the next MK lady, as Linsey Ryall improved by almost 10mins with her time of 2:25.21 and also finishing 4th in the F35 category. Making their debuts over this distance were Natasha Baker who ran 2:27.54 and Alex Tvarozkova 2:39.28. Dan Webber was first MK man home in 8th. agonisingly short of the 2 hour barrier in 2:00.33 for a PB as did Tom Comerford, 10th in 2:01.19 in his debut at this distance. Chris Dunn improved by 3mins to finish in 2:17.17 followed by Chris St.Leger-Harris(2:18.42), Martin Erasmus, 3rd M50 in 2:23.08, Stuart Boyer(2:23.28), Ross Wood(2:23.30), Neil Jones(2:28.33) and completing those who ran inside 2:30 came Chris Cahill(2:28.54). 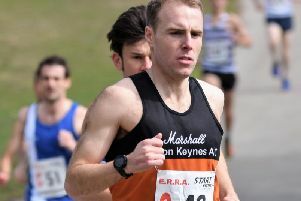 The half-marathon attracted almost 1600 competitors and there were two MK runners in the first 10. Jamie Seddon set a PB in placing 5th with a time of 75.19 whilst four places back came Steve Herring with 77.35 which won him the Eastern Veterans title, an event incorporated within the main race. In the top half of the field were Ian Wood(88.38), Eduardo Usteran(89.55), Russell Jones(91.26), Andy Stiles(94.29), Kevin Church(102.310 and Lisa Yabsley(112.56). There were almost 1200 finishers in the 10km race. Best results came from the ladies, Lara Bromilow clocking 38.42 for third lady and Elle Roche, on her way back after injury, placing fourth lady(40.44). Then a huge personal best for Sophie Gibbens(41.32) and fifth lady. Debra Brent closed in 2nd F50 running 47.26 and just ahead of Sioban Dyer(47.44), Mel Wright(47.53) with Diane Farmer finishing in 48.15 for 2nd F55 lady. Chris Finister led the local contingent, 17th in 38.02 with Michael Prest, 37th(40.57) and Martin Brent, 51st(43.01) just of his PB of 42.57 set in last years race. Finally over 500 finished the 5km race. Another local winner here, Mark Ryall who clocked 16.57 and won by over 90seconds. Oli Lum was 4th(17.54) and Mark Dowson 5th (18.25). Alice Ritchie (19.35) was first lady with Martinha Ferreira 2nd(20.59). Leading u15 was Alex Brent, 11th overell with a time of 20.30.